MUCH MORE THAN ANOTHER EYEPIECE! The Hyperion eyepieces from Baader Planetarium are the best choice for those who want a bright wide-angle eyepiece (apparent field of view 68°) and high eye relief (20mm). Due to the modular construction is also perfect for the photographic application both as afocal and eyepiece projection. The apparent field of view of 68 degrees is the largest fully visible to the human eye. The entire field also remains visible in case of involuntary movements of the observer's head. The optical scheme towith8 elements in 5 groups offers a great contrast and color correction. In addition, the eye relief is 20mm allowing comfortable use also to people wearing glasses. The use of high index optical glasses reduces distortion and astigmatism and the particular optical design eliminates ghost effects. You won't notice vignetting or light fall on the field edge. Unlike cheaper eyepieces using lower-quality glasses that cause a yellow or blue fringes to the images, Hyperion eyepieces have a perfect color fidelity: white stars remain white! The most advanced anti-reflection coatings are used in all 10 air-glass surfaces for maximum transmissivity and bright images. All coatings are performed exactly according to the refractive index of the different used glasses. Each Hyperion eyepiece is two eyepieces in one! Unscrewing the 31.8mm barrel containing the negative group, you get a 50.8mm eyepiece with longer focal length. Color correction remains excellent and the curvature of field is comparable to an Erfle type eyepiece. The 50,8mm barrel thus obtained has the thread for 50.8mm diameter filters. More, by adding one or more Finetuning FTR rings (between 31,8mm barrel and eyepiece body) you can change eyepiece focal length as reported in the table below (not available for Hyperion 24mm). With or without the removable group of negative lenses, the Hyperion eyepiece is a great and sharp projection system. 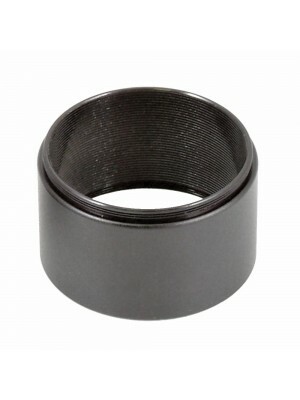 For photography in afocal mode, S54 and M43x0.75 threads have been incorporated in the eyepiece that, thanks to the use of Baader adapters, allow virtually any photographic camera or camcorder connect without vignetting. 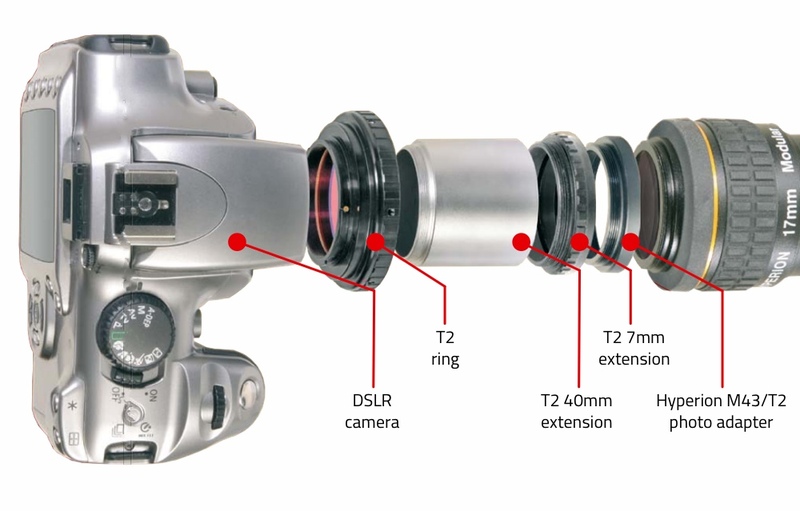 There is also a M43/T2 photographic adapter to allow the attachment of DSLR camera with T2 ring. The robust construction of the Hyperion eyepieces allows you to support heavy loads up to 3 kg. Each Hyperion eyepiece comes with two rubber eyecups, three anti dust caps (31.8mm, 44mm, 48mm) and a soft leather case. 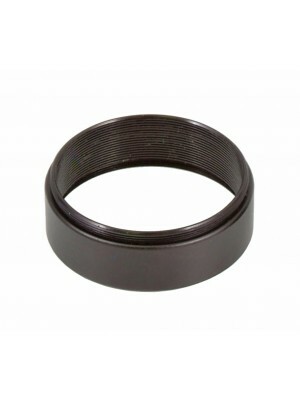 The upper eyecup can be folded back for eyepiece use with eyeglasses and protected with the 48mm cap, or may remain folded forward and protected from dust with the 44mm cap.